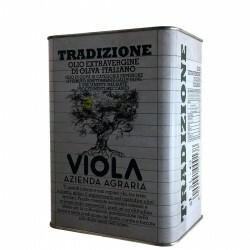 All the olive oils in can that we offer in our online shop correspond to the quality "EXTRA VERGINE". They come from well-known Italian producers such as Quattrociocchi, Cutrera, Muraglia, Agraria Riva del Garda and many others. Canisters made from high-quality stainless steel are a practical alternative to the classic glass bottle as a container for extra virgin olive oil. They are lighter and less sensitive than bottles and therefore also better suitable for shipping and transport. Another benefit: Olive oil in 3 or 5 liter can is cheaper than bottled. The same applies to the bag-in-box packaging: this also adds to the space-saving storage, the better eco-balance. Here you can find out more about the advantages of both types of packaging. All cans used to store extra virgin olive oil in can are made from high quality, tasteless material. This preserves the taste and smell of the valuable content, in the best possible way. In order to retain these organoleptic properties even after opening the can, we recommend topping the extra virgin olive oil into dark glass bottles or other containers with airtight seals and then protecting them from light at cool temperatures. All extra virgin olive oils that we offer in our online shop come from well-known producers from (almost) all regions of Italy. 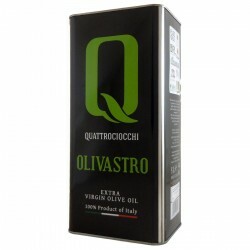 Their products have been awarded several times at the most important national and international olive oil competitions. This is not only true for the products in 500ml or 1 liter glass bottles. The larger containers (such as cans or Bag in Box) preserve perfectly the quality of the olive oil bottled in them. In the following, we invite you to a little foray into our range of olive oils in the practical cans. Let's start in Northern Italy: here we find the producers Agraria Riva del Garda, Bonamini and Sommariva. From Agraria Riva del Garda we have the Extra Vergine Italico in can. Its balanced middle fruity makes it an ideal ingredient for many dishes. This oil, available in the 3 liter canister , also complies with the strict quality guidelines under which the producer cooperative based in Riva, in the north of the Garda Lake, works. Further south, on terraced hills around the Amarone known Valpolicella, in the province of Verona, grow the olive trees of Bonamini. In addition to varieties that are common throughout the country, Bonamini also grows the rare local Gragnano and Favorol olives, which also contribute to the special flavor of the Extra Vergine San Felice: It convinces with its very fruity fragrance and is available in the 5 liter canister. Finally, last but not least - Antico Fantoio Sommariva. This long-established olive oil producer, who celebrated his 100th anniversary in 2015, is based in the Ligurian Albenga in western northern Italy. With the Extra Virgin Olive Oil Gumbo we offer you a taste of the very clear olive oil from Sommariva in the 5 l container. However, many of our olive oils in this segment are sourced from producers in central and southern Italy. For example, Extra Virgin Olive Oil Classico, which is bottled in a 5 liter canister, comes from Cooperativa Agricola Colli Etruschi, which is based in the north of the central Italian region of Lazio, in Blera near Viterbo. Founded in 1965, this cooperative today has about 380 members who work together on an area of ​​about 800 hectares. 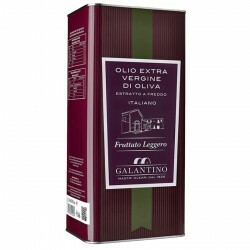 Its Extra Virgin Olive Oil Classico is characterized by its spicy flavor with herbal fruity and notes of grass and thistles. Always in Lazio, but in the south of the region, there is the family's farm Quattrociocchi. From its ancient, organically cultivated olive groves around the town of Frosinone comes among other things the Bio Olive oil Olivastro. This Extra Virgin Olive Oil is extracted exclusively from the Itrana variety of olives and has a scent of green olives, artichoke, green tomato and apples. 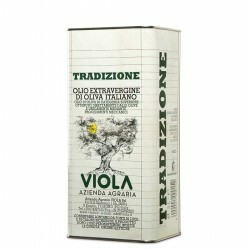 Other producers from Lazio are the olive oil mill of Cetrone family, which has been cultivating olives since 1860 and producing a Extra Virgin Olive Oil 3 liter can from the Itrana variety and Silvi Sabina Sapori. 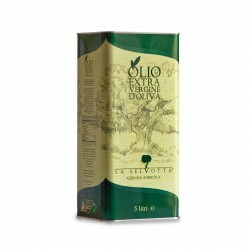 From its production comes an excellent olive oil with PDO seal, available in the 1 and 5 liters containers. A little further north, in Montenero d'Orcia, a small, picturesque village in the Tuscan Maremma, the olive oil factory Frantoio Franci is at home. It produces the Extra Virgin Fiore del Frantoio. Thanks to its mild, slightly fruity taste, this olive oil is something of an "all-rounder" in the kitchen: with its gentle artichoke notes, it is ideal for dressing salad or preparing mayonnaise, as well as for frying. From Tuscany you can also find the olive oils in the canister from the house of I Greppi di Silli: it has the romantic name Sinfonia d'Autunno (Autumn Symphony) and comes in a small 500 ml can. We showed some top producers from central Italy represented with their high quality extra virgin olive oils in can assortment. Now we move to the main producers from the south of Italy with olive oil in can: Muraglia and Galantino from Puglia and Cutrera from Sicily. 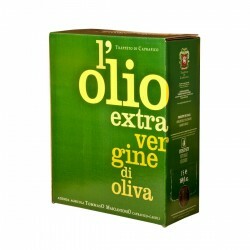 From Muraglia we offer, among other things, an intense and a medium fruity Olive oil in a 5-liter can. Both are monovarietal and have been awarded with the "2 olives" by Slow Food. Galantino, located in the province of Bari, also boasts numerous prizes, including the "Three Leaves" of the famous Gambero Rosso. The oils of Galantino traditionally produced are therefore not without reason among the most sought after Puglia. In our can assortment we offer one light fruity, one medium fruity and one Extra Virgin Olive Oil intense fruity of Galantino in a 5l can. Among the products of the also multiple award-winning Frantoi Cutrera from Sicily, the Extra Vergine Primo DOP Monti Iblei 3l stands out: it is cold pressed from the local olive variety Tonda Iblea and convinces with its distinctively flavourful aroma. Available in 3 liter and 5 liter can. This is only an overview of extra virgin olive oils in can. We were only able to show you a part of all our sortiment - you can find further products, also from producers not mentioned above, in our online shop. 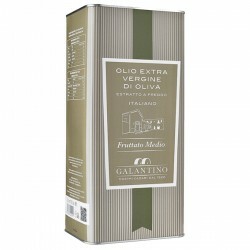 At this point, we would like to draw your attention to our first Extra Vergine in the Bag in Box packaging: it is produced by Trappeto di Caprafico in Abruzzo, exclusively with olives from centuries old trees. How do I properly store olive oil in the can? The shelf life of olive oil bottled in cans is 18 months. This is so clear from the "best before date" information which is printed on each of our can. Stainless steel is the most suitable material for storing olive oil. Therefore, the olive oils in cans, which you can find in our online shop, made from this. Our olive oil producers use sheet metal made of soft stainless steel, which is coated on both sides with a thin layer of tin. This ensures a smooth, luminous surface, which is also resistant to external influences. Why does it make sense to bottle olive oil from the canister? The answer is obvious: Olive oil is very sensitive to oxygen. On contact with oxygen, it oxidizes rapidly and loses its taste and health benefits in a short time: it's faster if it's larger the contact surface with the air. Therefore, after opening the canister, we recommend that you refill the olive oil in glass bottles, if possible in dark glass. Bag-in-Box packaging, or BiB for short, is a very practical alternative to cans: The packaging consists of a bag of film composite material (aluminum outside, polyethylene inside) and a box of corrugated cardboard. The bag is equipped with a tap that can be easily and safely inserted into the pre-cut opening in the box. The tap can always be used to remove the desired amount of oil. Each time it is removed, the bag contracts a little so that the contents are largely protected from contact with air. In this way the oil is stable for up to 6 weeks after opening. The somewhat time-consuming bottling is eliminated - this saves space! With all these advantages, the BiB packaging turns out to be the perfect solution for those who do not want to give up their beloved, high-quality Extra Vergine while on holiday in a motorhome or caravan: it not only guarantees long-term durability after opening, but is also great space saving and unbreakable.